Next week, on the 24th of April it's been 6 years since the Rana Plaza disaster in Savar, Bangladesh. - A large building with 11 floors. (8 up, and 3 down, under the ground) filled with clothing factories collapsed. 1138 people died and many were hurt and disabled for life. One year after the disaster I went to the ruins of the Rana Plaza building and noticed that nothing had been done to honor the victims. So I thought of a plan to show (my) respect. The site was still filled with the remains of clothes from the factories, full of dirt ofcourse. So my first idea was to collect all these clothes, wash them and hang them to dry on clothing lines. Unfortunately I did not get the permission to do this (or do anything!) at or around the site. This was because it would raise attention to the situation and this was exactly the opposite of what the local government wanted to happen. Now, five years later, I still think this first idea was a poetic one. 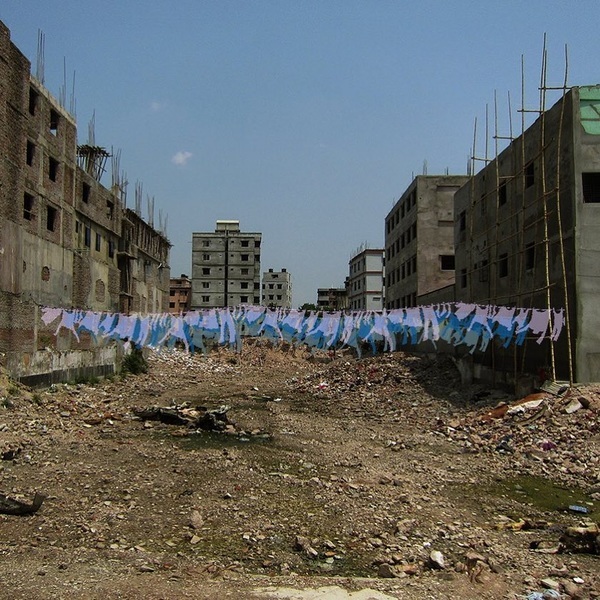 #RanaPlaza #RanaPlazadisaster #Savar #Bangladesh #cleanclothes #schonekleren #Bangladeshaccord #fairfashion #cleanfashion #respect #victims #artpiece #monument #design #rejected #poetic #TINKEBELL.